The company of The Public Theater's 2016 production of Sweat, written by Lynn Nottage and directed by Kate Whoriskey. 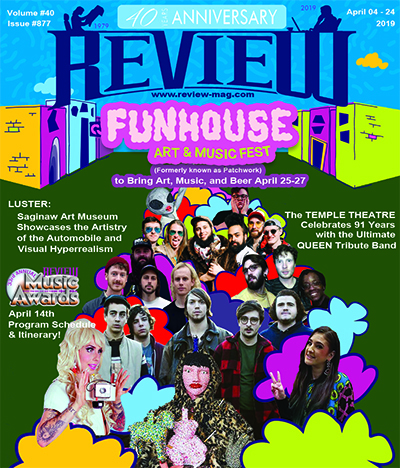 Throughout the fall numerous artists and organizations in Saginaw are partnering with the Public Theatre Mobile Unit National, which is based out of New York City, for several arts, cultural, and community outreach events happening throughout Saginaw over the next 4-months that are all based upon the theme of ‘Work’. The genesis for these events stemmed out of the Public Theatre Mobile Unit’s Sweat project. According to David Rzeszutek, Associate Professor of Theatre at Saginaw Valley State University, the project originated out of Joe Papp’s Public Theatre out of Manhattan, which stages a Mobile Unit to go to outstate New York communities in order to expose smaller communities to artistic projects they might not normally be able to access. SWEAT tells the story of a group of friends who have spent their lives sharing drinks, secrets, and laughs while working together on a factory floor. But when layoffs and picket lines begin to chip away at their trust, the friends find themselves pitted against each other in the hard fight to stay afloat. “With the NYC Public Theatre’s production of SWEAT: the Play on October 6th, the Director of the troupes’ production, Kate Whoriskey, will be revamping this touring performance with some of the actors that were in the Pulitzer Prize winning Broadway performance, which is very exciting,” he adds. “Sweat tells the story of Reading, Pennsylvania, but it could be any post-industrial city across the landscape,” said playwright Lynn Nottage. “One of the beautiful things about what we’re trying to do with the Mobile Unit National Tour is to link narratives and bring people not just in the communities into dialogue, but people across communities into dialogue and figure out how can we strategize and shift the national conversation,” reflects playwright Lynn Nottage. Other community events assembled by the local team involved with The Work Project include Blood, Sweat & Gears, a photography exhibit by Saginaw artist Nyesha Clark. This compelling exhibit will be on display at the Saginaw Warehouse Artist Guild, 1840 N. Michigan and open to the public on September 26th from 4-7 pm, with an Artist’s Reception on September 28 from 5:30-8:00 PM. Artist Nyesha Clark is a Saginaw native, multi-disciplined artist and activist. She is currently a senior at Saginaw Valley State University and pursuing a BFA with a concentration in photography. She works with local non-profit and social justice organizations such The Ezekiel Project, EJAM, YWCA racial justice team, Mothering Justice and Saginaw USDAC Community Arts Outpost. This is her third showcase this year with more to come soon. Blood, Sweat, and Gears is an exhibit that showcases the contrasting timeline of various automotive and parts plants around Saginaw, MI, starting from its inception to present day conditions. This series partly focuses on the life and livelihood of the Saginaw community before and after said establishments were built. Showing the promising past and the bleak reality of the present day when these plants were shut down. While some photos are meant to evoke emotion and dialogue, others are meant to highlight the juxtaposition of lines, color, form and negative space. Another Work Project event happening in November will be the ‘Get To Work’ Reading & Poetry Slam, which is an offshoot of the Get Work! Creative Writing Contest, sponsored by the Saginaw & Bay Area Community Writing Centers. Three $100 cash prizes will be awarded and winners may be published in the community literary arts journal Still Life. The ‘Get To Work’ Reading & Poetry Slam will consist of readings of the contest winners and poetry slam and be held at Counter Culture, 620 Gratiot in Saginaw on November 15th from 7-10 pm.